It’s do or die tonight for the Cape Breton Screaming Eagles at Centre 200. 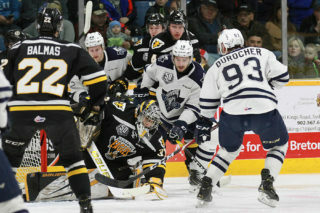 Following a 4-1 loss last night to the Drummondville Voltigeurs, the Screaming Eagles find themselves trailing 3-1 in their best of seven opening round series. Jarrett Baker, a native of Black Rock in Cape Breton, was the first star in game four after scoring the winning goal and posting a +2 ranking. With the goal Baker became the twelfth different Voltigeur to score during this series, and continued to a trend- in each of the three Drummondville victories this series, every goal has been scored by a different player. Opportunities were limited in the lowest scoring game of the series- just four goals combined discounting Pavel Koltygin’s empty netter, and the clubs combined for just 49 shots. Declan Smith was Cape Breton’s goal scorer in game four and continues his strong playoff play over the last two seasons- 14 points in 15 games. He along with the other veteran Cape Breton players will be key for the Eagles to try to climb into back into the series. The trio of Cape Breton overage players will look to extend their QMJHL careers to a game six on Sunday and beyond. Thus far through the series centre Phélix Martineau has two assists, winger Ty Fournier has scored twice, while defenseman Ross MacDougall has been held pointless thus far. All other QMJHL teams are idle this evening, so all eyes are on Centre 200. Tonight’s game goes at 7 PM. Tickets can be purchased at the Centre 200 box office, by phone at 902-564-2200 or online at https://tickets.capebreton.ca/Online/default.asp Go Eagles Go!